What time of day do you visit? Visit times are flexible. We work from 9.00am to 6.00pm but this is just a guideline and other times can be arranged. We cannot guarantee specific times unless timed medication is needed. How do I book a service once registered? 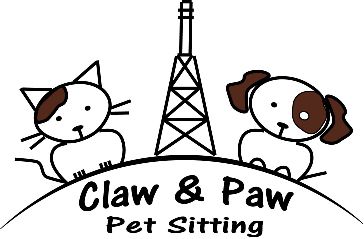 We use Pet Sitter Plus software so once you have registered with us you will have the option to book services using our online booking portal which includes a profile page of you pet. We also take bookings via by email or text. How long does a typical visit last? This varies depending on your requirements, but a standard cat visit would be approximately 20 - 30 minutes. During a visit we make sure your cat is fed, litter tray is cleaned and give them a cuddle. We try to minimise the stress of being alone, so if the cat wants to be left in peace we respect their space. A dog walk would typically be 30 minutes. Are you insured and security checked? Yes we hold valid insurance with Pet Business Insurance Ltd and we are security checked with Disclosure Scotland. We can provide this documentation upon request. Are you contactable while I am away? As part of our service we will be sending you regular updates of your pet via email, text or Whatsapp. We check our emails morning and evening seven days a week and respond to them on a daily basis. Any text or Whatsapp messages will be responded to as soon as we can. Will my home be secure? Daily visits add security to your home by keeping tabs on the property – we will take indoors any mail left for you and tidy up the bins. If requested we will also alternate lights and open and draw curtains to give your home that lived in look. Our vehicle is unmarked so no one would be aware of the pet-sitting service attending the premises. On leaving the property we will make sure that all windows/doors are secure and alarms, if fitted, are set correctly. We will collect your keys when you wish and hand them back to you when contacted or at a previously arranged time. If you wish us to keep your keys for another booking they will be stored in a safe at our home address.This also may be useful if you ever lock yourself out! What if my pet becomes ill? We will discuss with you any health concerns or medication during the initial interview and make notes in your own portfolio along with the name of your vet and their contact details. In any case of emergency we will contact you immediately. The main concern would be the welfare of your pet, insurance/arrangements with your vet will be discussed prior to your stay away.